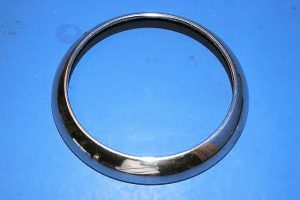 1949-1952 Chevy Headlight Bezel “sometimes called headlight rim” is stainless and is a reproduction. This headlight bezel also fits the 1947-1953 Chevy Pickup. These fit well and shine well and being made of stainless they can be shinned to be like chrome with some elbow grease. Like the 53 and 54 headlight bezels, these bezels uses the same O-ring between the bezela dnt eh ehadlight bulb. Also like the 53 and 54 headlight bezel that O-ring is held in place with 4 wire fasteners. The top fasteners also fits in a slot made in the headlight bucket and helds thetop of the bezel on the fender. The bottom of all of these bezels is held on with a chrome or stanless screw. What I am offering these individually but 2 are needed for each car or truck..